Nepenthes rhombicaulis is a highlander that is fairly easy to grow. There's a species profile of this plant in Charles Clarke's book "Nepenthes of Sumatra" if you want more in depth information. 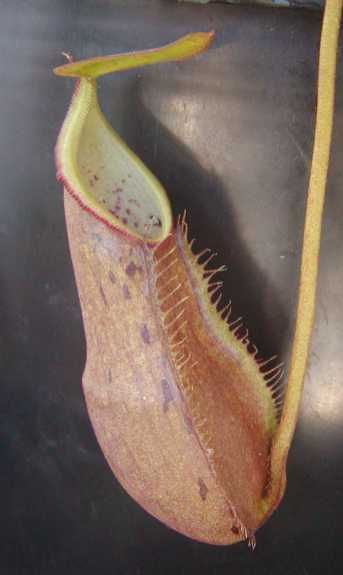 I'm waiting to see if my plant will put out the pitchers with the larger red peristome than the one pictured above. I will say that this plant really took off from the beginning. I thought for sure that it would go into shock and drop all of its pitchers because it was not a "rosetted" plant upon arrival. I was wrong! It adjusted well to my outdoor conditions and has produced pitchers as if nothing ever happened. When the growing vine started hanging over the pot, the plant produced several basal shoots. So for me, this plant is a vigorous and easy grower that I really don't pay much attention to. This species does show some stress during winter, but nothing compared to my intermediates I grow outdoors during winter time. Also, I've noticed that the leaves do yellow and bleach out a tad more than my other highlanders that receive a lot of direct sun. As of late, it seems to be hard to come by.